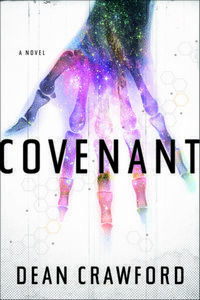 Covenant by Dean Crawford, a Mysterious Review. Review: Dean Crawford open his debut thriller Covenant in Israel, which for me is a place I have always wanted to visit … so I am eager to read further. Ahmed, a driver for Professor Damon Sheviz, is very knowledgeable about the Jordan Valley desert area. They are in search of the university's equipment and a Dr. Lucy Morgan, who has disappeared in this godforsaken place. She had found the remains of a creature, which she had simply declared as "not human". Ahmed was the last person to see her. The fast pace of the novel continues to unfold that had me hooked by the second chapter. Chapter 3 changes the location to the United States, where the plot thickens. In reading this book you will come to discover that the "covenant" is not just a theory, but a place. As Crawford winds his tale back and forth between Washington DC and Israel, you are drawn more and more to discover the mystical archeological overtones. The reference to a potential alien being is interspersed throughout, adding an interesting factor. The cast of characters that are introduced in a measured manner left me thinking this would make for a good movie. Special thanks to Lynne Gordon for contributing her review of Covenant. Acknowledgment: Simon & Schuster provided a copy of Covenant for this review.